Baking is not something I do very often, but I do enjoy it. Chocolate cupcakes have become my signature treat. I always use the Hershey’s Perfectly Chocolate Cake recipe and this American Buttercream frosting recipe from the blog Glorious Treats. It’s definitely a sweet combination but incredibly delicious. Since moving to Tennessee, I’ve had to adjust my baking time to 20 minutes for cupcakes. I think the oven in this house runs a little hot. If I bake for the minimum recommended time, the tops get a little bit firmer than I like. I’ve found that 20 minutes gives me that perfectly moist and light texture throughout the entire cupcake. I’ve also made minis with this recipe. After googling and doing a little trial and error, I found that 9 minutes is perfect for my oven. Depending upon your oven and the recipe used, the typical recommended range seems to be 10-14 minutes. 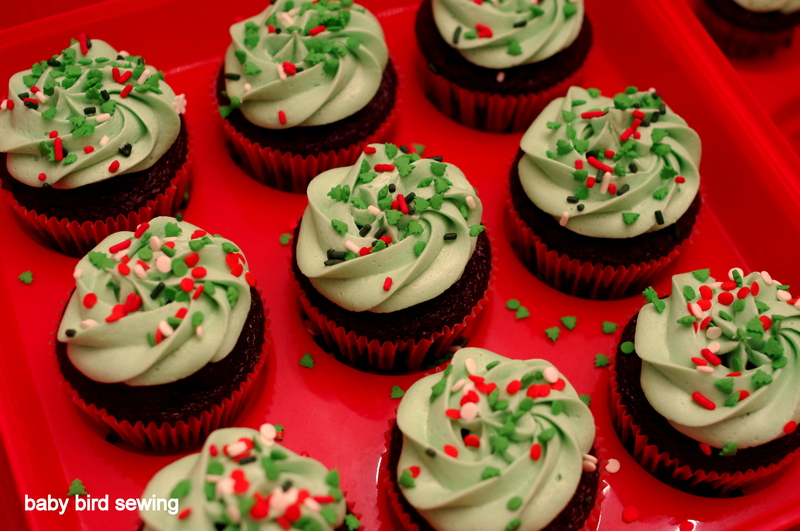 I made mostly traditional red and green Christmas cupcakes this time around, but the girls have been wanting me to make Frozen cupcakes. 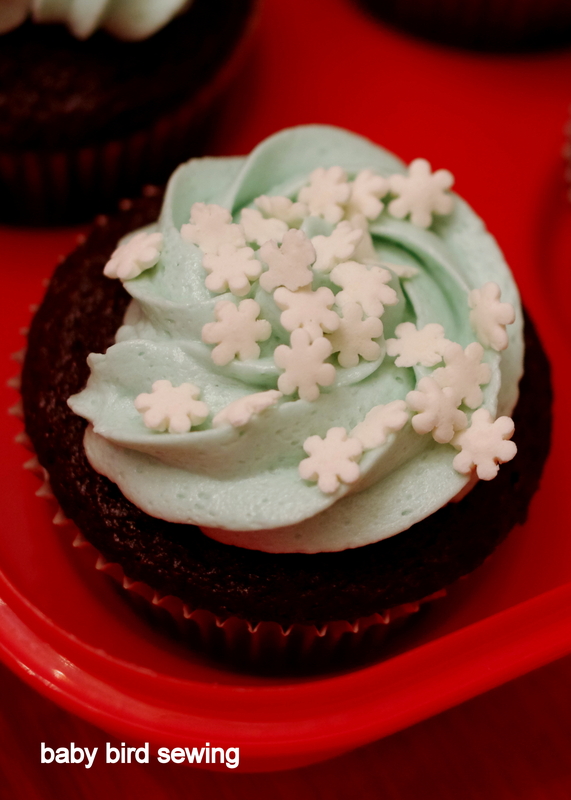 I separated my batch of frosting into two and colored one half green for the cupcakes above and one half with this light blue color similar to Elsa’s dress and the color used on Frozen merchandise. 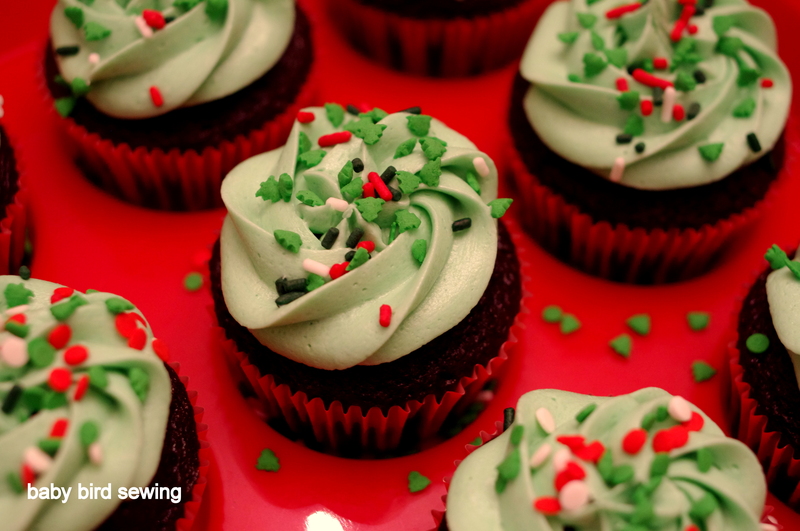 I want to make these cupcakes at some point with handmade snowflakes, but snowflake sprinkles were easier and more convenient this time around. And the girls enjoyed putting the sprinkles on themselves. It was a successful first attempt at decorating cupcakes with the girls. 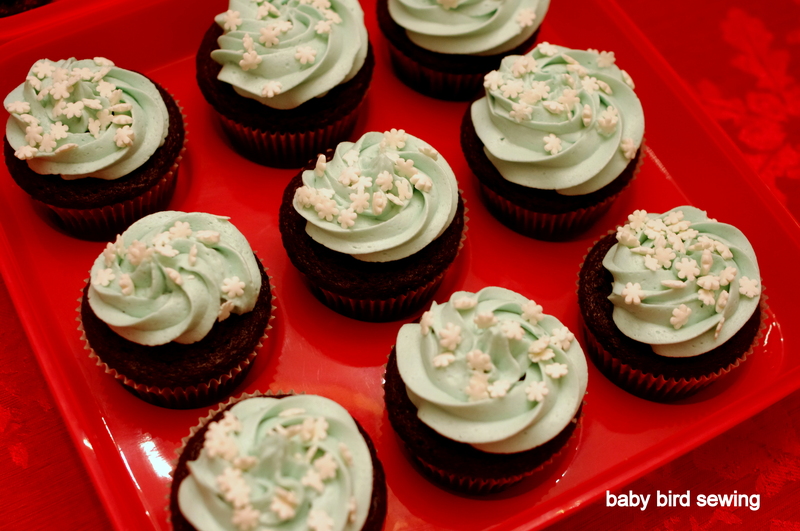 One at a time I would pipe frosting onto a cupcake and then let one of the girls put snowflake sprinkles on top. Then I would repeat with the other kid. We alternated turns until they were all decorated. It was a pretty low stress way of doing it. 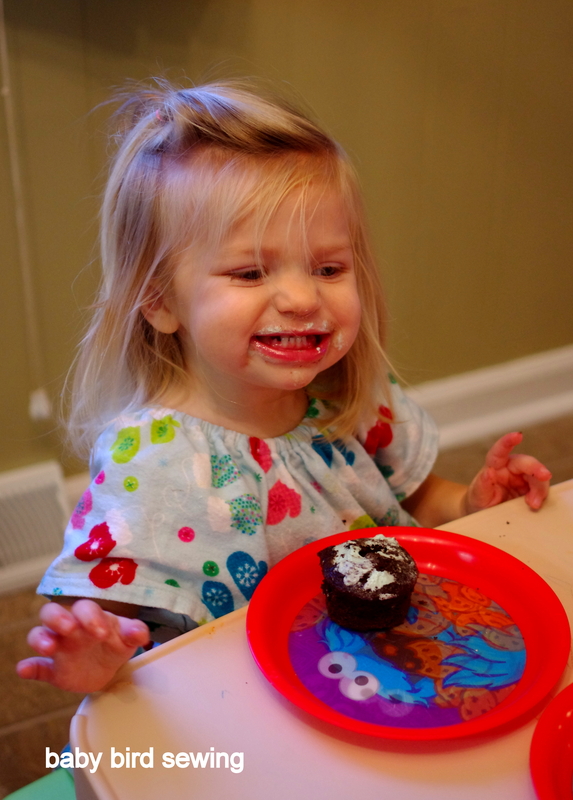 The only difficulty was keeping them from eating too many sprinkles between cupcakes. Every time I turned my back to put a newly decorated cupcake onto the counter and to grab a plain cupcake, they would each grab a bunch of sprinkles from the bowl and stuff them into their mouths (I had to dump the sprinkles into a bowl because the holes in the shaker top were too small for the sprinkles to come out?!). 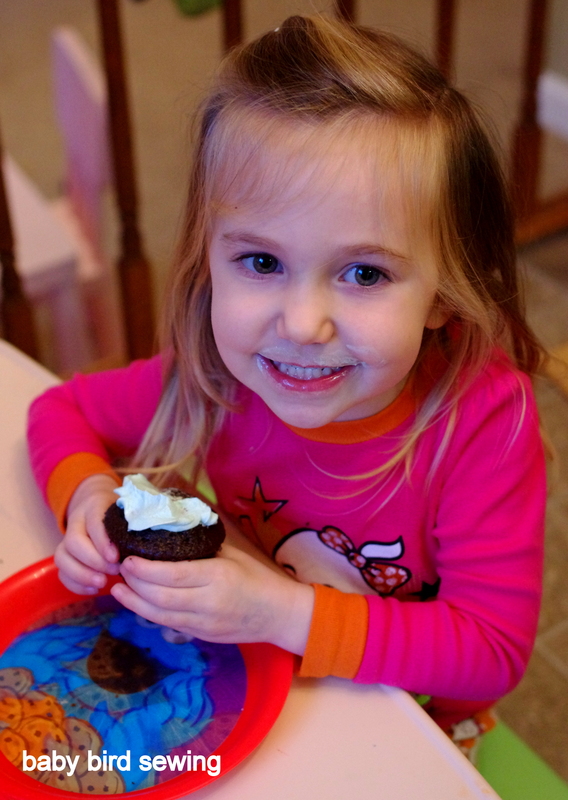 But we survived with enough sprinkles to finish our little batch of Frozen cupcakes! And as an aside, the red “plates” you see above holding the decorated cupcakes are actually cupcake holders from Dollar Tree. They have tops that latch on for storing and transporting. They aren’t the most durable plastic and I have never carried them by the handles just in case, but they are awesome. If you have a Dollar Tree nearby and they have these in stock, immediately run out and buy a bunch of these, you will not regret it!